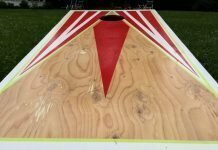 Everyone loves a good lawn game, and if you haven’t yet discovered the world of ladder toss, you are certainly missing out. Whether you have never heard of the game before and want to start playing or simply need a refresher course – we have got you covered. 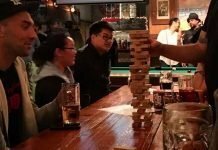 Between explaining the game, its history, the official rules, and how to play, you will be a ladder toss expert by the time you have read our guide. First, let’s talk about what ladder toss is. Depending on whom you ask, the game may be referred to as something completely different than ladder toss. 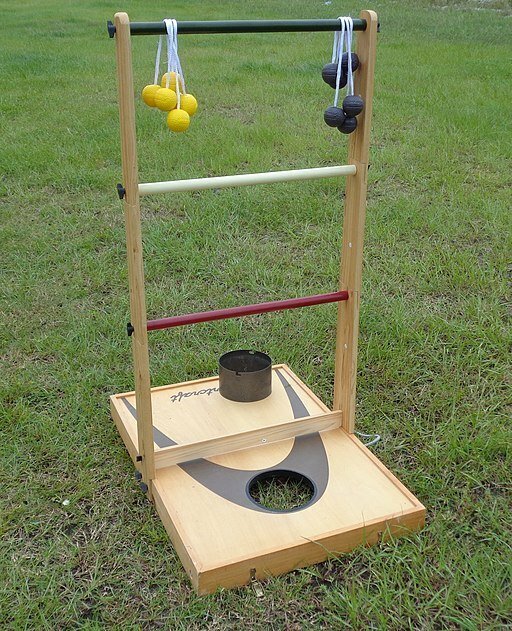 Other common names for the sport include ladder ball, ladder golf, hillbilly golf, and ball rope. 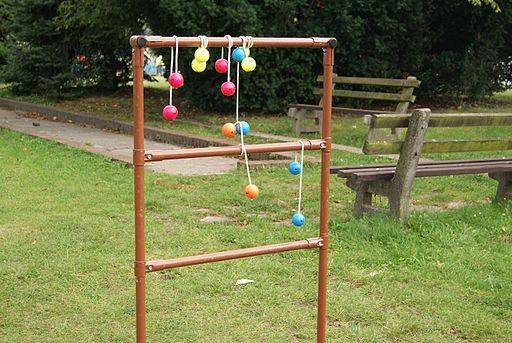 Simply put, this game consists of throwing bolas (two balls that are connected by a string) onto a wooden ladder. The ladder consists of 3 tiers: bottom, middle, and top. 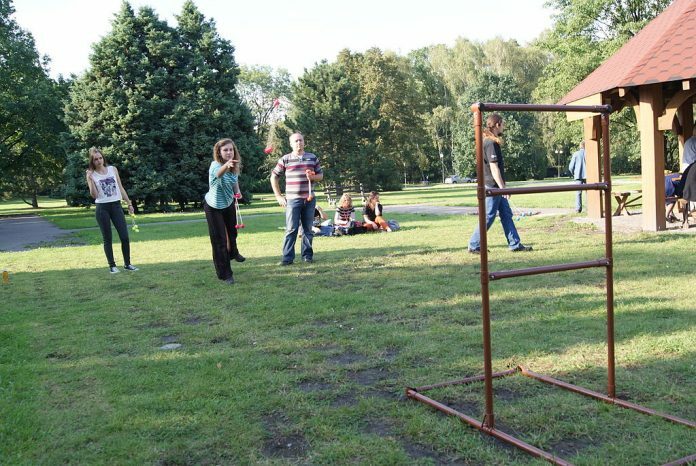 The object of ladder toss is to use an underhanded toss to get the bolas around the different steps of the ladder. This game is played in rounds, meaning that the players or teams toss 3 bolas on each of their turns. Your points are determined by which rung your bola lands on, so the ultimate goal is to always aim for the top rung. Let’s review the terms you will need to be familiar with to play the game. The ladder is simply the structure you need to land on to score. It consists of 3 different steps that are each spaced exactly 13 inches apart. A bola is the tool you need to toss to score points. It consists of 2 golf balls that are attached with nylon rope. The golf balls are spaced exactly 13 inches apart as well. Each ladder in the game has three steps. The top step is worth 3 points if your bola lands on it, the middle one is worth 2, and the bottom is 1 point. The toss line refers to the line that the players need to throw their bolas from. For an official game it is spaced 15 feet from the ladder, however, if you are just playing for fun in your backyard 5 paces is fine. 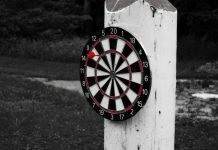 Now that you know the basics of ladder ball let’s take a look at the history of the game and how it has evolved over the years. A man named Harold Furry discovered the game in the early 1990s on campgrounds, and he believes the game most likely originated there. However, there is also speculation that the bola is a symbol for a live snake because cowboys in the west and Mexico would throw them at fences or branches for points. In 2001, a “ball and ladder game” was patented by a man named Robert G. Reid from Pennsylvania. He was a postman who had spent decades playing the game with his family, before deciding to file for a patent in 1999. 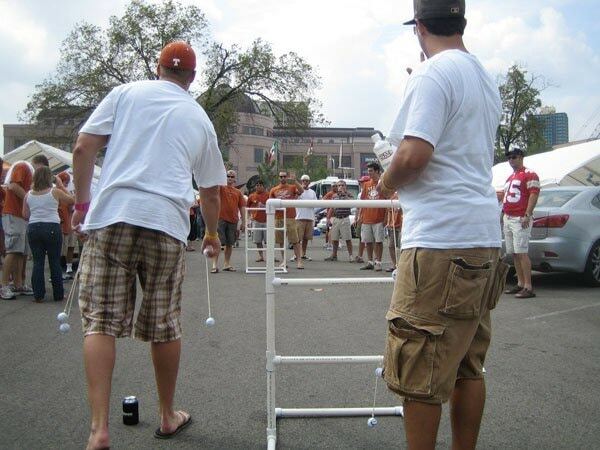 Reid then sold his patent to Ladder Golf LLC in March of 2005, and the company began to manufacture and sell the game. In April of that same year, the company sponsored a tournament of ladder golf in San Diego, which featured 32 different teams. 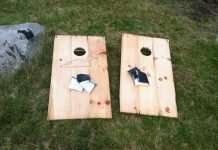 Since then the game has become even more widespread, you can purchase a set from many online retailers, and it’s a very popular option for a lawn game. So how does a typical game of ladder toss go? Like we discussed before, you will need a toss line set up before the gameplay. This means a line set back 15 feet (or 5 paces) from the ladder. The game is played in rounds, which each one consisting of all the players or teams tossing 3 bolas. To determine who is going to toss first, there is a coin toss. The player who goes first has to toss all 3 of their bolas before the next player can toss theirs. They can be thrown in an underhand through individually, and can even be bounced off the ground. Whoever wins the first round gets the first toss in the next round. Once every person/team has tossed their bolas, the number of bolas hanging from the rungs is counted up to determine the score. The players can knock off other bolas, or even throw them onto the same rung as another to hurt their opponent’s score. At the end of the round, only bolas that are still left hanging on the rungs (without any competing bolas) can be counted for points. 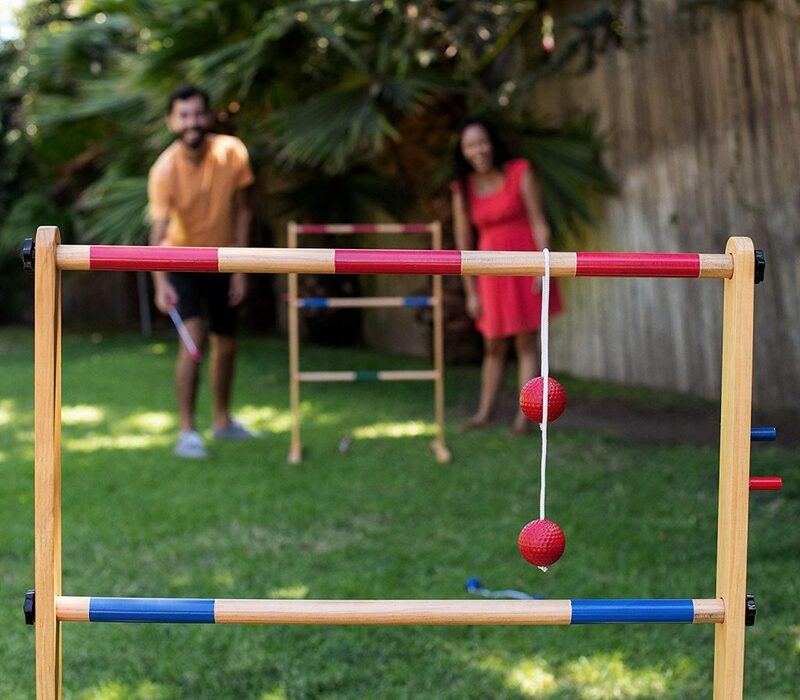 Up to four players can play ladder ball by simply alternating play each round. You can also purchase additional bolas so that up to 4 players can play individually on the same ladder, or even buy a second ladder. With two ladders, two players on opposite teams would stay near one side, and then the other two would be at the second ladder. One side would get to toss all their bolas, and the other team would toss them back. Otherwise, the same rules apply. Before you break out your set, you should know all of the ladder golf rules and regulations. 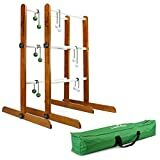 This will keep you and the other players safe, your ladder golf set in great condition, and the games fun and fair. First, let’s discuss the rules that will keep you and the other players safe while playing ladder ball. The bolas you use for the game are connected using special anchors. If used correctly, they will provide you with a lifetime of use. However, if you pull on them excessively, you could cause the anchors to separate from the ball. Only use them to toss onto the ladders. Do not wrap the bola around any body parts. This could cause issues breathing or with blood circulation. Do not stand on the steps of the ladder. While it is strong enough to withstand having the bolas tossed onto it, the weight of a human could break it and cause injury. Avoid swinging the bolas at all, unless you are tossing them at the ladder during your turn in the game. 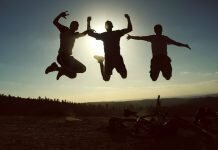 Carelessly playing with them could result in injuring yourself or the other players. Only one bola should be tossed at a time. It is against the rules to try and score with multiple bolas at once. While you are encouraged to distract with sound, movement, and remarks while your opponent is trying to score, you may not touch them during their turn. Doing so while they are attempting to toss the bola could hurt you or them. No one is allowed to walk to the ladder before the round in question has been completed. This could cause someone to toss a bola directly at a person instead of the ladder rungs. Like we said before, your points are determined by which rung of the ladder your bola wraps around. The top step is worth 3 points, the middle 2, and the bottom rung is worth 1. However, players can score a bonus of 1 point if they hang all 3 of their bolas from the same step, or if they hang one bola on each rung (one on the top, one on the middle, and one on the bottom) within the same round. The highest number of points a player can gain in one round is 10. This would only be accomplished if they got all 3 of their bolas on the top step. Once all players/teams finish tossing, scoring registers only the bolas remaining on the ladder. You are encouraged to play defensively by attempting to knock your opponent’s bolas off the rungs. The game is played to a point total of exactly 21. A player can win by being the only one to score exactly 21 points after a round ends. If you are close to the end but go over the exact point total, your points for that round do not count. For example, if you currently have 17 points, you need exactly 4 more to win. If instead you gain 6 points during that round, none of them count and the game continues. You will go into the next round still at 17 points, needing 4 more. If there is a tie, the two players/teams in a tie continue to play overtime rounds until one of them ends a round 2 points ahead of the other. However, this 2-point rule only applies during these special overtime rounds. During the regular rounds of the game, you can win as long as you score exactly 21 before anyone else does. In some cases, the standard scoring rules may not apply. Keep these in mind to add a little extra competition to the game. A birdie occurs when you land your respective bolas on each rung, and your opponent does not also land on any of them. In this case, you would have achieved a birdie and gained six points for landing your bola on each rung (1+2+3), plus that additional point for a total of 7. A hat trick means that you have landed all three bolas on a single step without any of your opponent’s bolas being on the same one. When a hat trick occurs, you are given an extra point. So, if you got all 3 of your bolas stuck to the middle step, you would have 2+2+2, for a total of 6 points, with one bonus point added to make 7 for the round. Keep in mind, however, that if you toss all 3 of your bolas onto one rung, and your opponent lands one of theirs on the same rung, their bola would cancel out one of yours. Instead of you receiving 6 points for that round, you would receive 4. Lastly, we have a Zelda. This occurs when you beat the other player/team 21-0. There you have it – ladder toss (or ball or golf) in a nutshell. 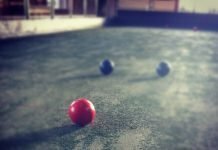 While it isn’t too complicated of a game to play in the backyard, you will have a much better time after brushing up on the rules. Interested in getting started? All you need is a game set and space to play. You can purchase the set online, or even build your own if you’d prefer.